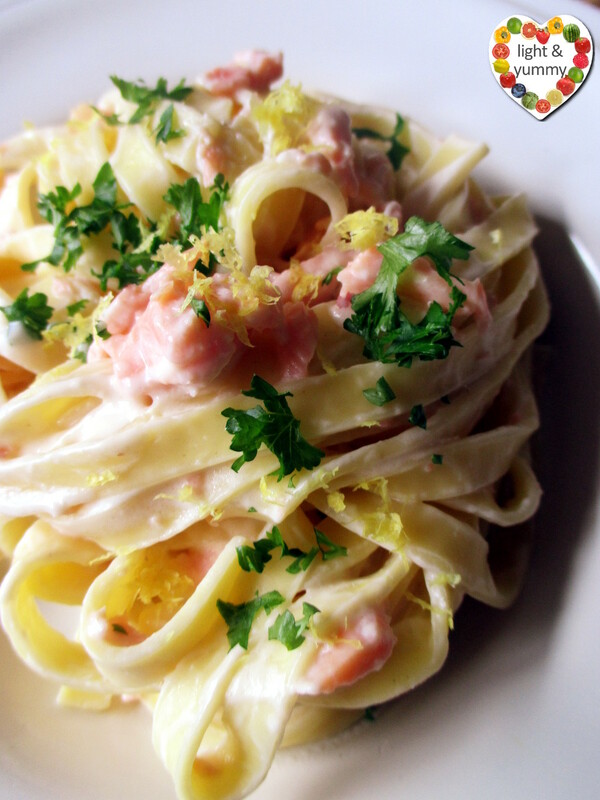 Creamy salmon tagliatelle with lemon, no cream, ready in 15 minutes! The traditional recipe calls for full fat thick cream but trust me: it’s not necessary at all. It can easily be substituted with ricotta cheese or, even better with salmon, some Philadelphia light. The whole recipe yields 2 big portions as a complete meal or 3 smaller, when for example followed by a second dish. 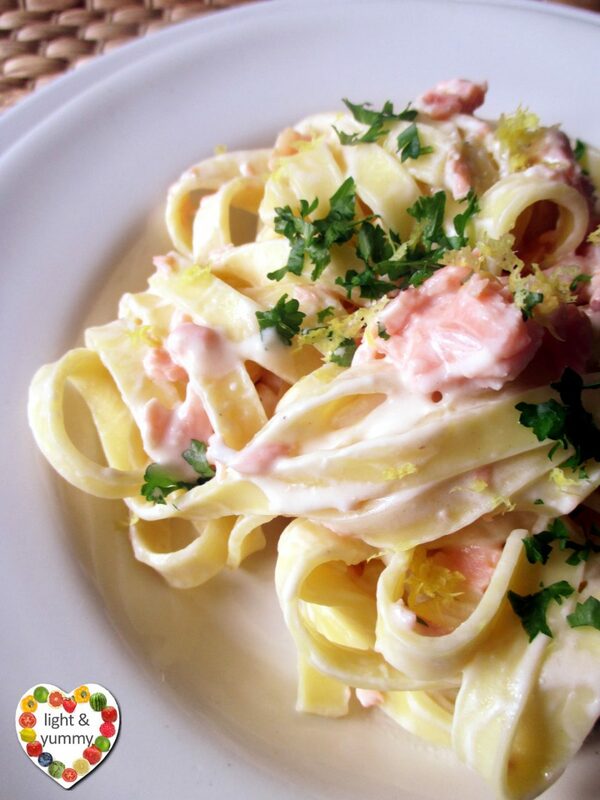 Creamy salmon tagliatelle is a pasta dish absolutely delicious! Even my partner, always sceptical when I try to lighten a classic recipe, has cleaned the plate and asked for more. Try to make this dish for your guests, nobody will even suspect they are eating a diet recipe! Measure and prepare all ingredients first so to be precise if count the Weight Watchers Propoints. The only preparation is to slice the salmon in little stripes or cubes. Put a pan with plenty of water and a some salt on the cooker. While it warms up prepare the sauce: warm the oil in a large non stick pan then put the salmon in. Add the juice of a lemon: the quantity depends on your taste, personally I squeeze a whole lemon in it! When the salmon becomes lighter in colour put the heat to minimum. If the water is now boiling this is a good time to put the pasta in and give it a good mix. While the pasta cooks use a little water to thin the creamy cheese in a bowl. Pour the cheese in the pan with the salmon and mix well. Add a little pepper if you like and salt to taste, I didn’t add any because the smoked salmon is salty enough! Mix well. When the pasta is cooked take a cup of the water and keep it for later before draining the pasta. Pour the pasta directly in the sauce and mix well. If it is a little dry add the reserved water until it has the right consistency. 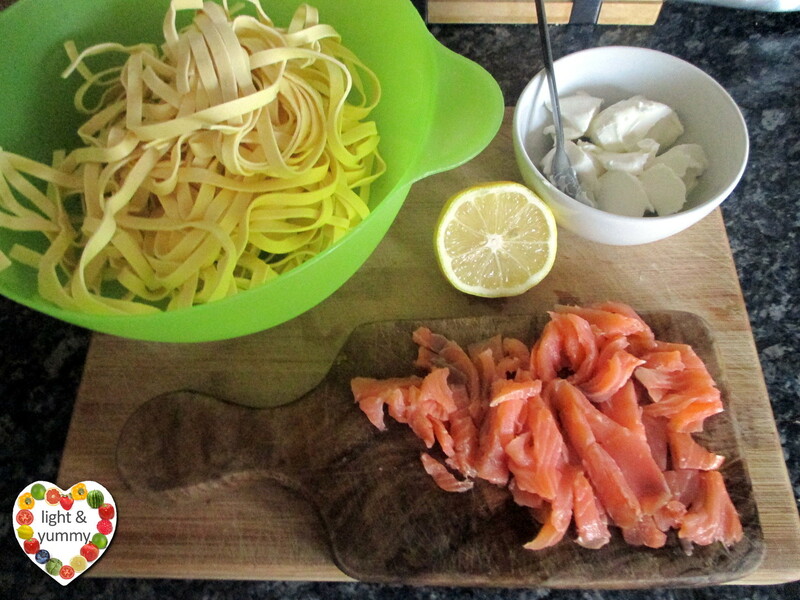 In 15 minutes our creamy salmon tagliatelle are ready to be served! Add a little grated lemon peel and some finely chopped parsley to decorate each plate, to make it really elegant. We say in Italian: anche l’occhio vuole la sua parte, which means: also the eye wants its enjoyment! Did I already say that this pasta dish is delicious? 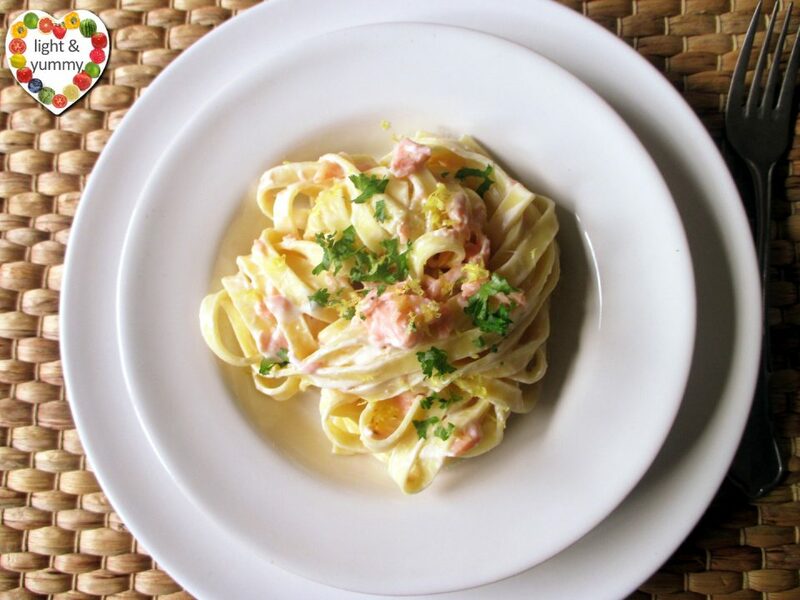 And I must admit that I am not a great fan of smoked salmon, but the creamy cheese makes the taste more delicate so I enjoy this dish thoroughly… Try it for your next dinner party and let me know in the comments below or my facebook page what you think of it! 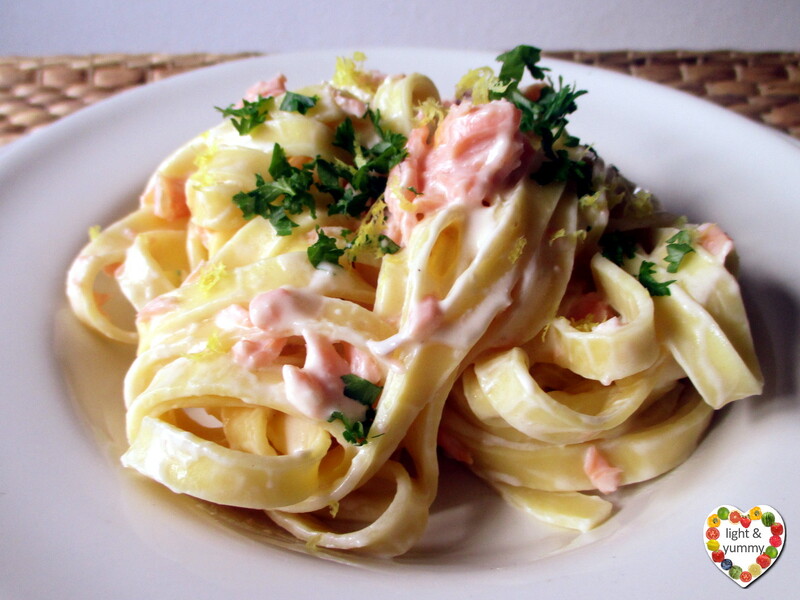 Another very quick pasta dish with fish is this: Pasta with frozen seafood. Don’t miss it! follow light & yummy on facebook!